Call it a balcony, or call it your "other living room," either way, it's awesome. Pool. Hot tub. Beach. Repeat. Days like these are hard to beat. Sleep in as long as the little ones will let you, then head down to the complimentary buffet. Find a spot on the lush green tanning lawn ideally located between the beach and pool. Set the levels, crank your tunes and go. You're located right on the beautiful beach. You'll love being away from the crowds and enjoying Myrtle Beach in peace. You're just a 15 minute walk to the Children's Museum of South Carolina. Downshift into leisurely vacation mode, where you take days at a whole different (much nicer) kind of pace. Smack dab beachfront, The Strand - A Boutique Resort makes entertaining the family entirely effortless. The surf and the sand do all the work – you just keep an eye on them from under your umbrella. Get your day off to the right start with the resort’s free continental breakfast. After you eat, head back to your condo and start digging through your bags for the sunscreen and inflatable dolphins before hitting the outdoor oceanfront pool. Work on your backstroke or relax in the hot tub and supervise the kid’s game of Sharks and Minnows. If you want to work on your sun-kissed look, grab a lounge chair on the tanning lawn and get comfortable. Feel like a workout? The resort’s fitness center has everything you need to get your cardio on. Air-conditioned one- to two-bedroom condos sleep four to six guests and have Oceanfront Views. Stop by the Piggly Wiggly for groceries – your full kitchen won’t stock itself. When you return from the store, whip up a batch (or three) of double chocolate brownies and let the little ones assist. Don’t worry if the eggs and flour decide to go rogue, that’s what the in-suite washer/dryer is for. Take a night off from cooking dinner and dine at the resort’s on-site restaurant. On your way back to your condo browse the free DVD rentals and bring a few back for family movie night thanks to the Flatscreen TV with Cable and DVD player. Pop some popcorn, call the little ones into the living room and ask for a show of hands to decide what to watch first. 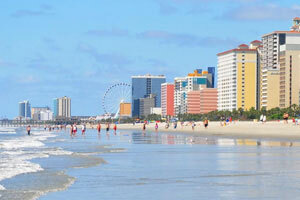 The Strand - A Boutique Resort is just a short drive to some of Myrtle Beach’s best attractions. Experience the best views of Myrtle Beach on the SkyWheel. It’s almost two-hundred feet tall, and the climate-controlled gondolas ensure that everyone in the family can ride in comfort. Broadway at the Beach has a variety of shops and restaurants. Get creative and make your own jewelry at Pick a Pearl while the kids get creative and make their own stuffed animals at Build-a-Bear. For collectibles, gifts, and jewelry check out The Mole Hole. It features jewelry from Pandora, Brighton, Spartina and Kameleon. Surprise the kids with a visit to the Children’s Museum of South Carolina to check out the interactive exhibits. They will have so much fun that they won’t even realize they’re learning. They can be a bank teller or customer at The Big Bank, a contractor at the Under Construction House or a newscaster/weatherperson at The Weather Center and Continuous News Desk. Check out the Family Kingdom Amusement Park. It has over thirty-five thrill, family and kid’s rides.